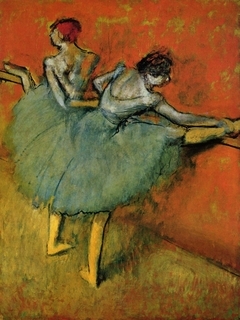 Degas' best-known works are those inspired by the ballet. 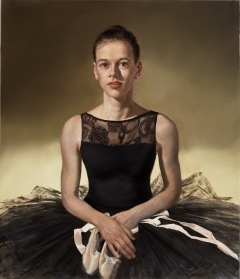 For an artist committed to the depiction of modern life, the theater in all of its forms--the ballet, the opera, even the more raucous café-concerts--held a special appeal. 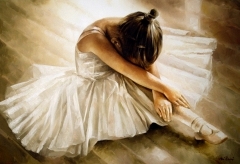 What intrigued him the most, however, was not the formal, polished performance, but rather the behind-the-scenes, casual, candid moments of dancers rehearsing or resting. It is a theme that the artist was to explore time and again, not only in his ballet paintings but also in his horse-racing scenes. 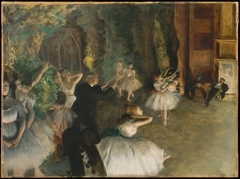 Painted c. 1879, The Dance Lesson is the first ballet scene in a distinctive group of some forty pictures, all executed in an unusual horizontal format. 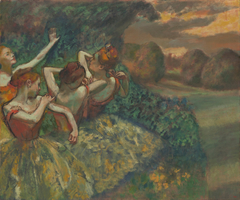 Degas had already begun to experiment with this format in some of his racing scenes in order to create an almost panoramic sense of space. 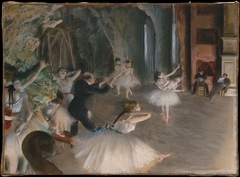 In the ballet scenes, the setting was transformed into an oblong rehearsal room populated by dancers in various states of activity and exhaustion. This format, which has been likened to a frieze, has a decidedly decorative quality. 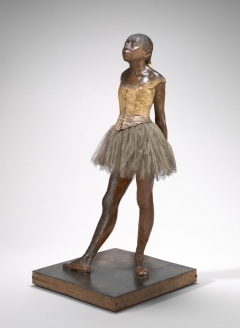 Degas' fascination with the unexpected views and flattened forms of Japanese prints is also apparent: figures are sharply cropped and placed off center, while the floor, which dominates the scene, seems tipped upward, an illusion that is accentuated by the elongated format. 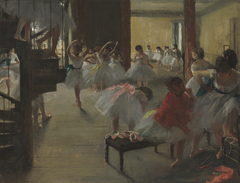 Like most of his ballet scenes, The Dance Lesson is a deceptively straightforward image. Although the overall effect seems spontaneous, the picture was carefully orchestrated from start to finish. 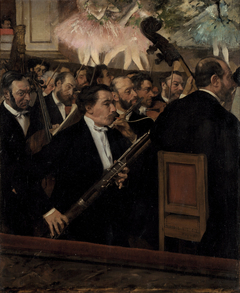 Degas produced a compositional sketch in one of his notebooks (possibly after he had already started the painting), laying out several crucial components: the seated figure at the center, the window at the far right, and the double bass and open violin case at the far left. 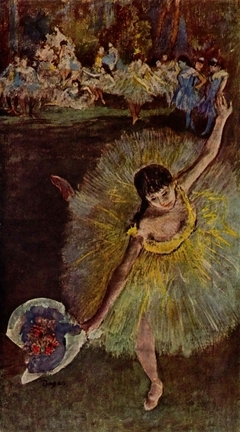 Into this basic framework he then introduced the figures of other dancers. Pulled from a number of his drawings and other paintings, these figures, like mannequins, were moved and arranged in artful configurations. 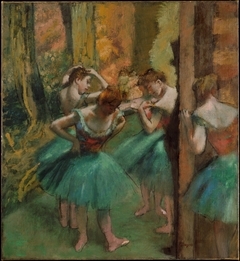 The dancer adjusting her bow, for example, appears not only in a number of pastels but also in several paintings from this group of friezelike compositions (The Detroit Institute of Arts, The Metropolitan Museum of Art, New York). Even after the forms had been placed within the composition, they were subject to change. 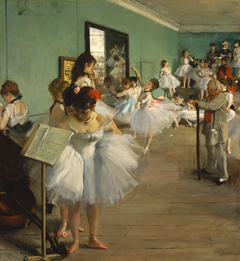 Degas altered a number of details, many still visible to the naked eye: the angle of the seated dancer's foot; the positioning of the legs and back of the chair; and the violin case, which the artist painted out at an early stage. 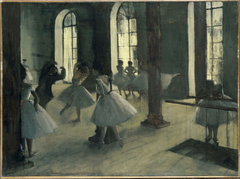 When shown in the fifth impressionist exhibition in 1880, The Dance Lesson passed largely unnoticed, and what commentary it elicited was equivocal. 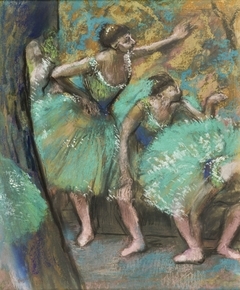 The critic Joris Karl Huysmans admired other works Degas exhibited and praised the artist's keen observational skills. 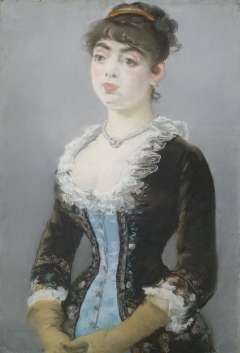 Nevertheless, he characterized this painting as "dismal," though more in response to the mood than to the execution. Paul Mantz, troubled by the artist's tendency to slip into caricature, was less enthusiastic, though he did praise its "transparently fine atmosphere."